One of the highlights of a player's career, earning a cap for your country, is an incredible honour in itself and a testament to how well you've played in domestic football. So when someone reaches that magical holy-grail figure of 100, then you know you have a national legend on your hands. A century of international appearances underlines the success of achieving that difficult combination of skill and longevity, and very few can lay claim to doing so. As such, here is a look at the 12 current Premier League players who have broken the ever-elusive 100-cap mark at international level. The latest man to join this illustrious list, ​Eden Hazard achieved the feat with Belgium in their 2-0 victory over Cyprus on Sunday. 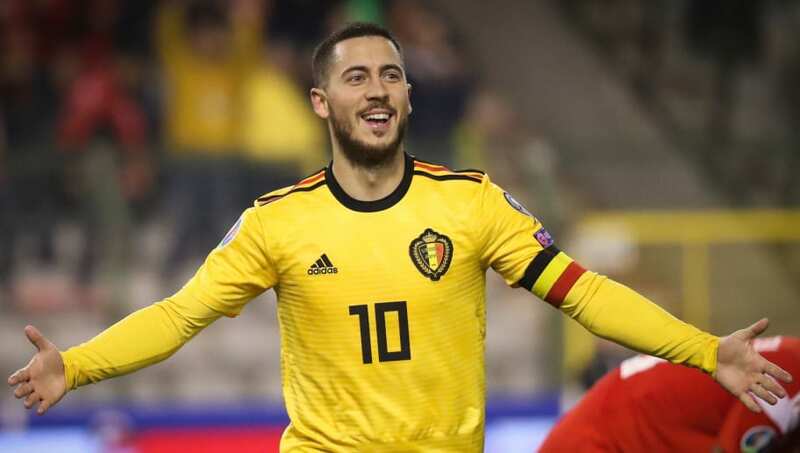 The ​Chelsea star duly marked his 100th appearance for his country with a goal and helped them move to the top of Group I in the Euro 2020 Qualifiers. A prodigy at Lille, Hazard made his senior debut aged just 17 in a friendly against Kazakhstan, before scoring his first international goal three years later. The 28-year-old's biggest highlight at national level came when he captained Belgium to a third-placed finish in the World Cup last year, and receiving the Silver Ball as the tournament's second best player. A serial winner at Juventus, Lichtsteiner arrived at Arsenal last summer with vast amounts of experience at both club and international level. The 35-year-old has been a mainstay of the Swiss side's defence for more than a decade, operating either as an orthodox full-back or wing-back with relative ease. A full international since 2006, Lichtsteiner is currently Switzerland's third-most capped player of all time, and has represented his country at two European Championships and three World Cups. Despite not looking a day older than 12, 'Chicharito' has been in the game for a long time since his break-through years at Manchester United. The man referred to as the 'Little Pea' has been a goal-scoring machine at international level, scoring 50 times in his 107 appearances. At just 30 years old, the Mexican still has plenty of years in him, and will hope that his continued time playing in the ​Premier League with ​West Ham will help add to his international cause. One of the Premier League's best goalkeepers, Hugo Lloris joined an illustrious club of players who have captained their national side to World Cup triumph when he did so last year with France. The ​Tottenham shot-stopper has been a reliable presence in between the sticks for the north London side, and after his performances last season, was voted runner-up for FIFA's Best Goalkeeper of 2018. After a couple of fine seasons at Celtic, Ki made his move to the Premier League to join Swansea. After a loan spell at Sunderland, the South Korean returned to the Liberty Stadium and was a key part of the side's midfield until the club's relegation to the championship. Picked up on a free transfer by Rafa Benitez for ​Newcastle, the 30-year-old has mainly been a bit-part player in his first season on Tyneside. The second Tottenham player to feature on this list, Vertonghen holds a special place in Belgian history. The centre-back became the first player to reach 100 international caps when he featured against Portugal last year. His 111 appearances and counting for the Red Devils is a record, whilst his talents in the Premier League saw him named in the PFA Team of the Year last campaign. When you talk about signings of the season, surely ​Wolves' capture of Joao Moutinho is right up there in the conversation? The Portuguese star has struck up an incredibly understanding alongside compatriot Ruben Neves at the heart of the Molineux side's midfield, dictating the tempo and taking to the Premier League's hustle and bustle style with consummate ease. A full international at the age of 18, Moutinho featured at the 2006 World Cup and has maintained his presence in the senior side ever since, and was part of the triumphant Euro 2016 team. If there was an annual award for football's nicest guy, then Shinji Okazaki would undoubtedly be in the running (although N'golo Kante would probably take the cake for that one). The Japanese star is a cult hero at the King Power Stadium with his relentless running and never-say-die attitude, and was a key component of ​Leicester's Premier League title miracle in the 2015/16 season. With 50 goals for Japan, Okazaki finds himself third in the all-time goal-scoring charts, only behind Kazuyoshi Miura (55) and Kunishige Kamamoto (80). Despite finding himself out of favour at ​Manchester City since the arrival of Ederson, Claudio Bravo has been Chile's number one for more than a decade. The shot-stopper is Chile's second-most capped player of all time (the first of which comes up next in this list), and captained the side to two successive Copa America victories in 2015 and 2016. With a ruptured Achilles tendon last year keeping him out of action, Bravo has been unable to add to his caps tally, but with his return, will no doubt return straight to the starting line-up for Chile. The man with the most caps in Chile's international history, it is fair to say ​Alexis Sanchez has enjoyed a stellar career at international level. Long-term teammates with Bravo during the side's successes, El Nino Maravilla aka 'The Wonder Child', is also the country's leading goal-scorer with 41, and wrote his name down in Chilean folklore when he scored the winning penalty in the 2015 Copa America final against Argentina. His performances at ​Manchester United may be declining, but when he puts on the red of Chile, Alexis returns to the form he showed at Arsenal and becomes the feared forward he once was. Hanging up his gloves at the end of the season, ​Petr Cech will go down as one of the Premier League's greatest ever goalkeepers. Holding the record for most number of clean sheets in league history with 202, Cech has also been a stalwart for his country. Making his debut in 2002, the 36-year-old represented the Czech Republic in the 2006 World Cup, as well as the 2004, 2008, 2012 and 2016 editions of the European Championships. One of Manchester City's greatest ever players, ​Silva began his international career with La Roja at the age of 20, and has since then become one of 13 players to have amassed over 100 caps. His 35 goals makes him the fourth highest goal-scorer in Spain's history, whilst his 28 assists leaves him in second in that list. A cornerstone of the country's unprecedented successes in the late 2000s and early 2010s, Silva was part of the side that won the Euro 2008, the 2010 World Cup and then Euro 2012.